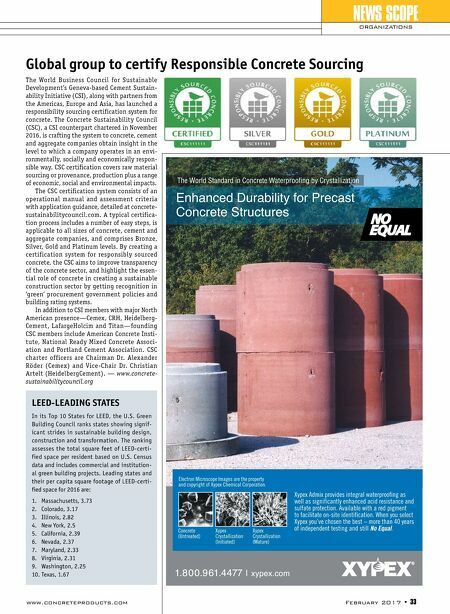 32 • February 2017 www.concreteproducts.com Under the umbrella of the World Busi- ness Council for Sustainable Development, LafargeHolcim Ltd. and its global counter- part in steel, ArcelorMittal, are aligning with other key construction players to advance Energy Efficiency in Buildings (EEB). The initiative addresses a major opportunity for reducing fuel consumption and attendant greenhouse gas emissions, and will bring together public and private sector leaders in NEWS SCOPE PRODUCERS LafargeHolcim joins initiative targeting barriers to energy-efficient buildings LafargeHolcim charts an Energy Efficiency in Buildings lab agenda. The next phase, EEB Amplify, was launched in December at the cli- mate-geared Conference of Parties 22 gather- ing in Morocco. local markets to understand barriers to ener- gy-efficient buildings and drive investments improving the built environment. As part of a sustainability strategy dubbed 2030 Plan, LafargeHolcim commits "to helping our customers avoid 10 million tons of carbon dioxide released every year from their buildings and infrastructure. We plan to achieve this tar- get using our innovative materials solutions, such as low-carbon concrete and cement, insu- lating concrete and thermal mass solutions." 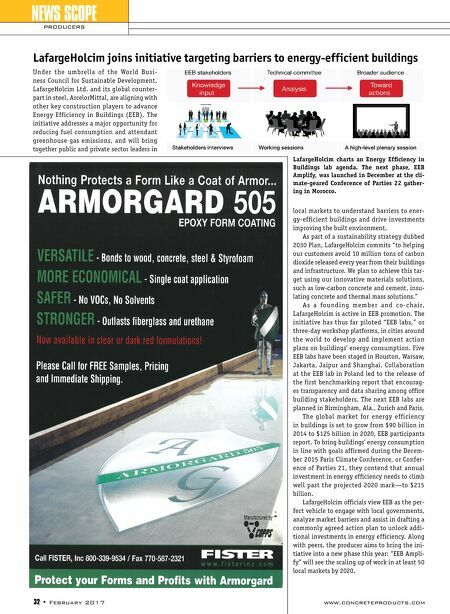 As a founding member and co-chair, LafargeHolcim is active in EEB promotion. The initiative has thus far piloted "EEB labs," or three-day workshop platforms, in cities around the world to develop and implement action plans on buildings' energy consumption. Five EEB labs have been staged in Houston, Warsaw, Jakarta, Jaipur and Shanghai. Collaboration at the EEB lab in Poland led to the release of the first benchmarking report that encourag- es transparency and data sharing among office building stakeholders. The next EEB labs are planned in Birmingham, Ala., Zurich and Paris. The global market for energy efficiency in buildings is set to grow from $90 billion in 2014 to $125 billion in 2020, EEB participants report. To bring buildings' energy consumption in line with goals affirmed during the Decem- ber 2015 Paris Climate Conference, or Confer- ence of Parties 21, they contend that annual investment in energy efficiency needs to climb well past the projected 2020 mark—to $215 billion. LafargeHolcim officials view EEB as the per- fect vehicle to engage with local governments, analyze market barriers and assist in drafting a commonly agreed action plan to unlock addi- tional investments in energy efficiency. Along with peers, the producer aims to bring the ini- tiative into a new phase this year: "EEB Ampli- fy" will see the scaling up of work in at least 50 local markets by 2020.